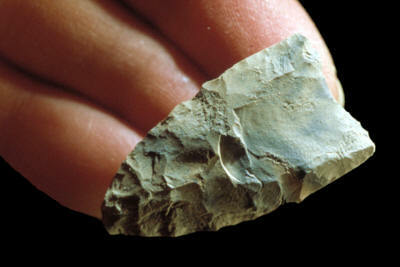 This small fluted point was found on August 15, during the 2006 field season excavation of the Shawnee-Minisink site. The site is located in northeastern Pennsylvania at the confluence of the Delaware River and Brodhead Creek. This small heavily resharpened Clovis point represents one of two fluted points that have been found there. It was discovered within the Clovis occupation level near a hearth feature that provided an AMS date of 10,970 (OxA-17371) RCYBP. This Clovis point was made from a low quality very course and grainy piece of chert that has not been positively identified. One suggestion is that it is made of a low grade piece of Normanskill chert. The color is mottled and spotted with various shades of gray. One side also has a reddish hue that might suggest that it was exposed to heat, which could be anything from a grass fire to a camp fire. The very slight reddish color on one side might also be caused from minerals in the soil. This point is fluted on both sides and it measures 1 9/16 inches (4 cm) long. The Shawnee-Minisink site is located on the second terrace above the present channel of the Delaware river. The site contains four basic stratigraphic zones. The upper level includes the plow zone and an underlying sandy silt which produced artifacts from the Late Archaic to the Late Woodland period. Zone two consists of two feet (60 cm) of sandy silt and it produced artifacts from the Early Archaic period. Zone three was a sterile sand stratum. Zone four consists of mottled sand. This lower level produced a considerable amount of material from the Paleo-Indian tradition. Two Clovis points, fragments of bifaces, several dozens of scrapers (most of which have been identified as end-scrapers), utilized flakes, an anvil stone and five hammerstone-abraders have been found. 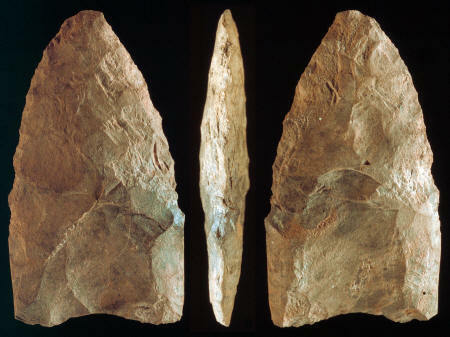 This picture shows three views of the original Clovis point from the Shawnee-Minisink site.